Chicago Chapter Committees Need your Help! In order to continue to grow ou r chapter and the programs we offer, the Steering Committee needs your help and your skill set. We are looking for several TTN Chicago members to help the Steering Committee and hope you can find the time to work with us. This individual will maintain records of meetings, agendas and minutes. She will attend steering committee meetings and calls; record proceedings and write minutes for distribution and approval by the committee; post minutes online. In collaboration with the Marketing Committee and other committees for events, announcements and other activities, this person will be responsible for developing content and posting information on the TTN Chicago website. Strong writing skills are key, as well as competence in web-based communications. Familiarity with web page editing tools similar to WordPress is necessary. This person will be responsible for posting articles and news of interest to our TTN Chicago community, including updates on events provided by our team/committees. A familiarity with Facebook page management, as well as an interest in issues related to women 50+ and Chicago happenings is a must. This person will help design marketing communications pieces. Experience in designing communications and some aptitude in using design software is important. This TTN Chicago member will be responsible for updating and maintaining our membership list in a spreadsheet. Basic knowledge of Excel is needed. This person will be responsible for developing a system to warmly welcome new members to TTN through a variety of methods. This individual will help plan and organize chapter-wide social events to engage TTN Chicago members. Several members are needed to speak at the conclusion of every TTN chapter event – telling attendees why they joined TTN and how TTN has played a role in their lives. We expect these functions would require about 2-3 hours per week each, maybe less (maybe more at times). If you have the skills set and the time, we’d love to have you help us grow our chapter. 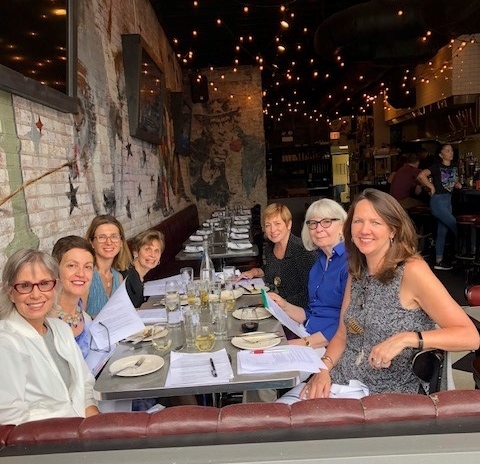 Please email Kimberly Mulcahy at ChicagoChapter@TheTransitionNetwork.org if you are interested in helping and she will connect you with the right Steering Committee Member. We are pleased to introduce our new Steering Committee members.